“I’ve just returned from a trip to a remote part of Sulawesi, where I found a Vanda species growing in huge numbers on trees in 2 mountain valleys. I am fairly certain it is an undescribed species. When I have finished doing drawings & a full description, I’ll circulate it around various experts and see if they concur. 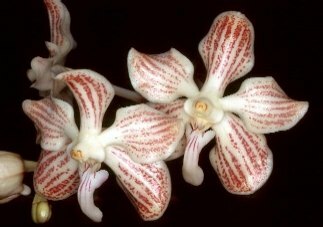 “After several days of scouring the libraries and reading the original descriptions of all likely candidates, I’ve come to the conclusion that the Vanda species I saw in Sulawesi recently… is Vanda arcuata J.J.Smith. Needless to say, this discovery has generated a great deal of excitement in the orchid community. Most aficionados dream of the prestige of discovering and naming a new species, and experts were quick to praise Peter for avoiding this temptation. “There is a bit of a story behind the discovery of these plants. I first saw this species some 5-6 years ago; one plant was flowering under a shade-net in an orchid-collection in the garden of a house in a town in the Poso Valley. I took some photos of the plant & chatted to the owner for a while. She was from a different part of the island and had brought the orchids with her to remind her of home, which is a quite common thing for Indonesians to do. I came back to Singapore and, on the basis of the photos, decided that it was probably an undescribed species, so I’d have to go back and follow it up. The civil-war, which was just starting in ’99, got much worse and for the next few years it was too dangerous to return to the Poso area. By early 2003 the war had died down, so last August I went back to the Poso Valley. The house was still there, but it had been heavily machine-gunned and was standing empty …. there was no sign of the owner and her family. The shade-house was still there, but no orchids … someone else was using it to cultivate cocoa seedlings. The neighbours said the family had gone back to their village, and asking around produced the names of the village and it’s subdistrict.